How long has it been since I’ve been able to post a WIP Wednesday? WAY too long. Alas, these are the things that happen when … well, when life happens. In case you have no idea what happened, you canread this post to find out more. That’s a great question and the answer is that there is a lot that is going on: from getting caught up, redoing pictures that I lost, shooting videos, working on some contractual obligations, and teaching classes in my studio this fall … there’s a lot to do! Here’s a few pictures of what’s been going on in my polymer clay studio since my last WIP Wednesday post. Week 29’s dragon for the #2015PCChallenge is Pinwheel, a new jointed galaxy dragon. You can read about her here. While she posted to the FB page, because of computer issues, no blogs were written about her. But, she’s all ready to go with her story and her fun now. Read about her here. These samples of black clay with glitter were the base for Pinwheel. Week 30’s #2015PCChallenge dragon was Whirlpool, another jointed galaxy dragon. You can read all about Whirlpool here. This my cousin who was visiting from Germany, Dörte. She is holding some words that she purchased here in the States. She painted them a lovely ombre shade. We had a lot of fun that afternoon in the studio. Maci is my new executive assistant. It’s about time my computer got an upgrade! I was very blessed this week to receive a free sample of the new Fimo Professional polymer clay from Staedtler in the mail. Thank you so much! I can’t wait to try it. While I was on my nearly disastrous vacation, I purchased a lovely new Sorcerer Mickey painting for my studio wall. It’s the bright blue painting on the bottom right in the picture of my “art wall of fame” in my studio. My new faux rusted metal fall necklace was made from a pile of scrap metallic and brown clays that I had leftover from another project. The first picture shows them prior to being strung. The second picture (on the log) shows them in their full glory. I can’t wait until fall gets here to wear this lovely piece. This berry lovely color palette was used to make a new dragon, Razzi. You will meet her soon. These two pictures show two of my jointed dragons in the process of being made. You can get a tutorial to make your own jointed dragon here. Here are two other dragons in the making: Razzi & Whirlpool. If you haven’t kept up with the Top Five Series for polymer clay, you are missing out. In the meantime, check out our newest guest blogger, Wendy Jorre de St Jorre as she shares her top 5 polymer clay tips for the perfect millefiori cane every single time. Get the tips here. 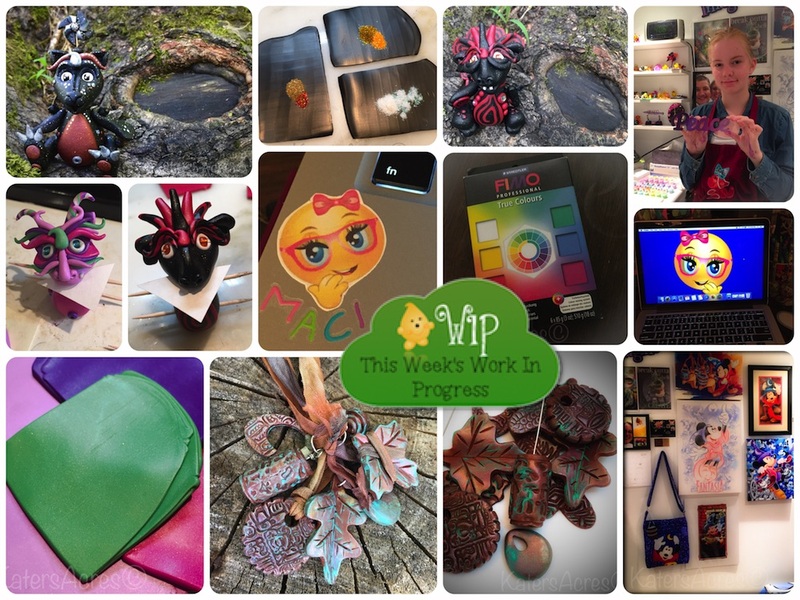 Are you keeping up with Polymer Clay Daily? Cynthia shares gorgeous and inspiring work each & every day. Grab a cup of coffee, sit back, click through, and enjoy.